Why Isn't My Printer Printing? Most of the time, our printers are like our moody-but-reliable friends. You know, they work pretty well but then they stop printing and start spouting out error messages. Sometimes it even seems like they are hiding from view when they are clearly right in front of us. So, what's with the occasional cold shoulder? It's amazing how many times the basics are often overlooked. Even when something such as the power going out occurs. Remember, it's possible to keep on working on your laptop, and forget ​the obvious and wonder why the printer isn't showing up on your laptop. Does it have power? ​(Check the power strip if you're using one. Maybe it's off or got fried in a power surge). A wired networked printer was once the norm. Now, wireless printers from HP, Epson, Brother, and many other manufacturers are common. While they provide an easy way to share a printer with multiple devices, such as a computer, laptop, tablet, and smartphone, they also introduce another level of troubleshooting difficulty when they stop printing. Restart everything: Wired or wireless network printers rely on your home network, which consists of a few different components: the printer, a computer, a router, a wireless access point, and a modem to connect to the Internet. Your network may have additional items or combine some of the items together. No matter how your network is configured, it all interacts, which means that if one device gets hung up, it can affect all the others. Try restarting all the devices to get the network humming again. Do not RESET a device to factory defaults, a common option, but simply restart. Once your network comes back up, try the printer again. Check network printer connectivity: Try printing a configuration/test sheet directly from the printer. With network printers, this will usually include information about how the printer is connected to the network, including its IP address, a URL for accessing the administrative page, the type of network connection, plus additional information. If needed, check the printer manual for details about how to perform the local test print. 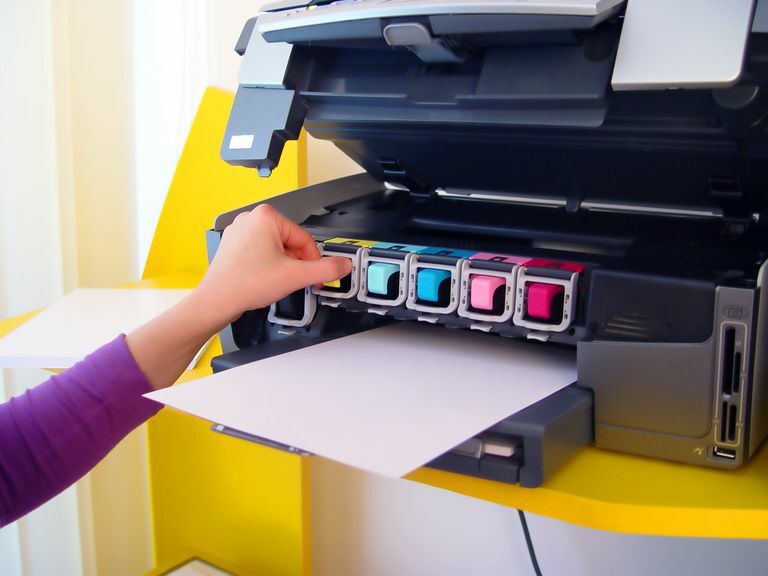 Once the test sheet is printed, confirm that the printer is connected to your network by checking the IP address; it should be similar to the rest of the addresses on your network. If you see an IP address starting with 169, it's an indication that the printer couldn't connect to your network and is using a self-assigned IP address. You can fix self-assigned IP addresses using the guide: DHCP - Dynamic Host Configuration. Reconfigure the printer's network settings: If you still can't get the printer connected to your network, you can try starting fresh. Turn the printer off, disconnect it from your network, and then reinstall the printer following the original instructions in its manual. Be sure to keep a record of any printer or network passwords that may need to be created. Reinstall or reconfigure any special network drivers for your printer: Once you have the printer able to communicate over the network, you may need to install or configure specialty network drivers for the printer, such as AirPrint for iOS devices or Cloud Print for Android devices. Printers connected by USB are a bit easier to troubleshoot. Remember to start with the obvious. Is the USB cable connected? Is power turned on to the computer and printer? If so, the printer should be visible to your computer. On a Mac, you can check the Printers & Scanners preference pane (under the Apple menu and in System Preferences) to see if the printer is present. If it's not, you need to install the printer on your Mac. In Windows, you can check the Printers control panel. Depending on the version of Windows you're running, the control panel may have slightly different names, but if it has Printers in its name somewhere, you're in the right spot. If you need to install the printer, select the Add Printer button, and follow the onscreen instructions. Still not seeing your printer? Try disconnecting and reconnecting the USB cable. If that doesn’t fix the issue, try removing all other peripherals from your computer, and only connecting the printer. If this fixes the issue, a bad peripheral is likely preventing other devices from connecting correctly. You can plug devices in one at a time until you find the culprit. Still stuck? Try a different USB cable. This is one reason to wait a bit before installing new operating system upgrades; let someone else be the guinea pig. If your printer suddenly stops working after a system update, chances are you'll need a new printer driver. Check with the printer manufacturer and see if they have new drivers available, then follow their install instructions for the drivers. If there are no new drivers, send the manufacturer a note asking when they will be available. If you discover the printer is no longer going to be supported, you might still get it to work. See if a printer in the same series as yours has updated drivers. They will likely work for your printer, though you may lose some functionality. This is a bit of a long shot, but if it's not working already you don't have anything to lose. No matter how easy clearing paper jams is supposed to be, they never are. And that's often a leading cause of future paper jams. Often when pulling out the wadded-up piece of pulp that was once a sheet of paper, a small piece will always get torn off and remain in the paper path, waiting for the next sheet of paper to come by, and cause the next jam. When clearing jams, be very careful and make sure every little bit of the jammed sheet is accounted for. If you still have occasional jams, you can try a good cleaning using special paper that is designed to clean the rollers, platens, and other objects in the paper path. You can find these cleaning sheets at most office supply stores. Ink and toner problems can include streaking and fading (which usually indicate a dirty print head) or toner in a laser printer that is running low. For inkjet printers, chances are the print head needs a good cleaning. The printer utilities app that came with your printer includes a cleaning option. There are usually two; a light clean and a heavy clean. Start with the light clean, since cleaning uses a good deal of ink. If that doesn’t fix the issue, try the heavy clean option. For laser-based printers, the likely cause is low toner, indicating it's time to change the toner. If you don’t have a toner cartridge handy, you can extend the life of the current cartridge by removing the toner from the printer, and slowly tipping the cartridge from side to side. Be sure the cartridge is closed when you do this. With any luck, this will redistribute the toner within the cartridge and provide you with enough prints to give you time to find and purchase a replacement cartridge.